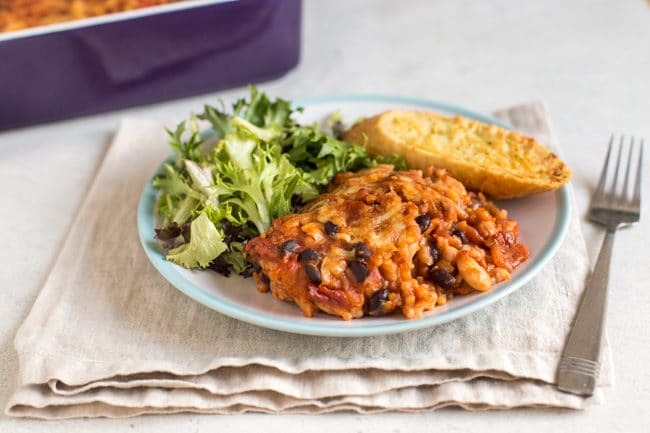 This cheesy bean bake is the perfect vegetarian crowd-pleaser! With cheesy beans, rice and a rich tomato sauce. 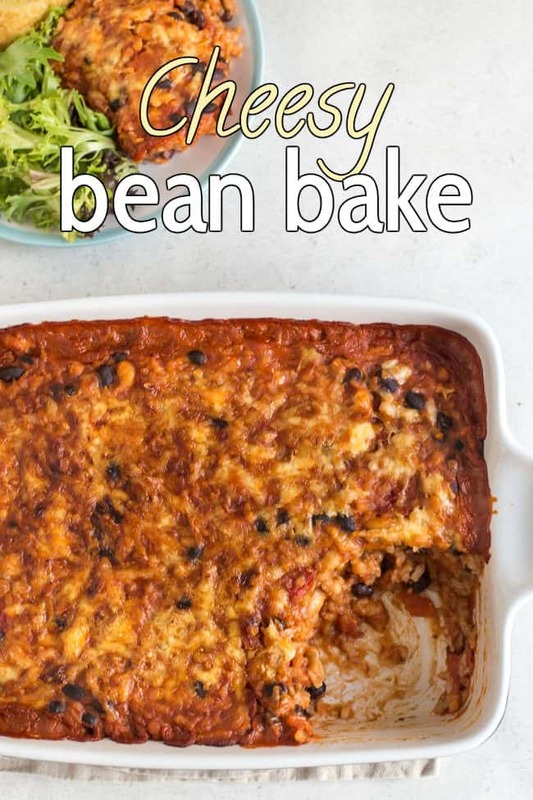 I’m so excited about this cheesy bean bake! 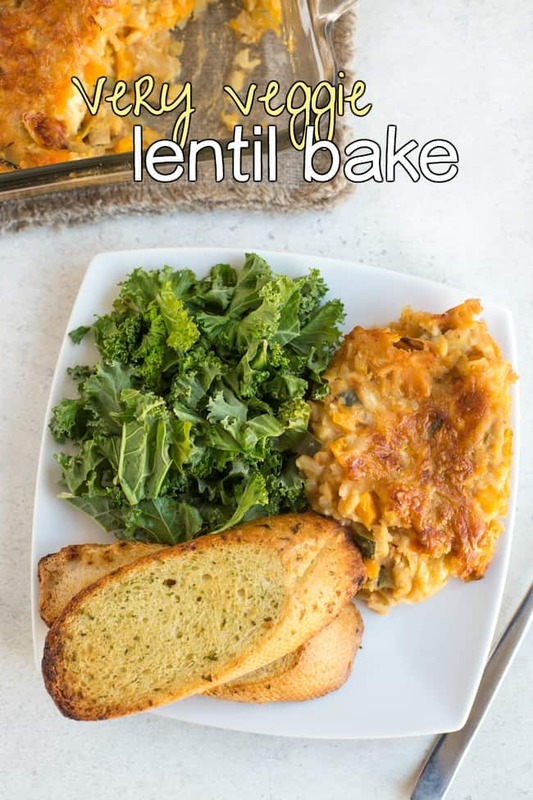 You guys love my very veggie lentil bake so ridiculously much (way more than I thought you would, actually – it still gets nearly 1,000 views a day more than a year after I posted it!) that I thought I’d make you a beany alternative – and it worked even better than I was hoping! I think I might have enjoyed this bean bake even more than I enjoyed the lentil bake? Maybe? It’s a tough one to call. But it’s a good sign when I make such a big batch of something that we have to eat it for three nights on the trot, and we don’t mind one bit. 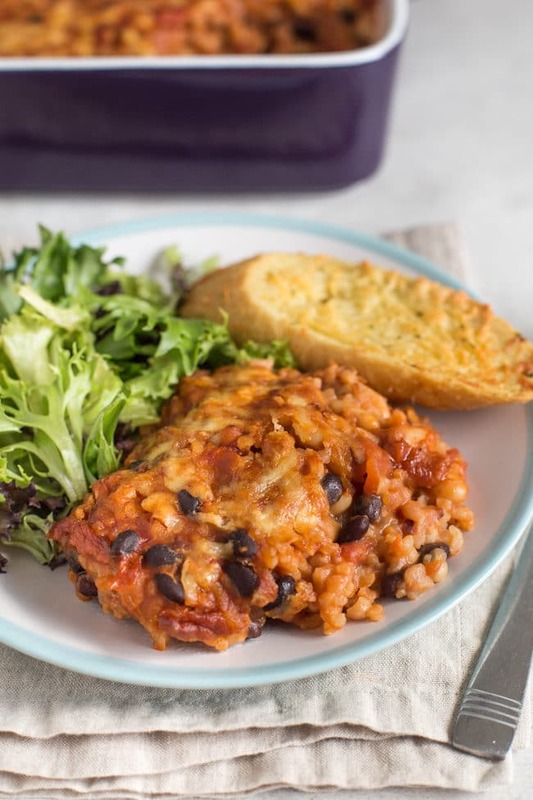 There are four main ingredients in this cheesy bean bake – beans (three kinds! ), cheese, tomatoes, and arborio rice. The end result is nice and rich, with a hint of creaminess from the cheese, and a crispy topping. The arborio rice (the kind you use in risotto) also adds to the creaminess, and gives a great carby base (good stodge!). Honestly, I could happily eat this every night with some garlic bread. Just my kind of comfort food! 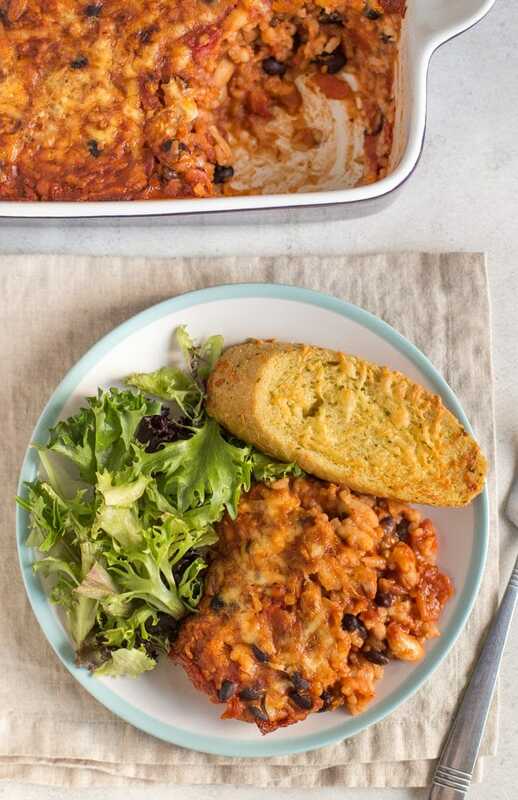 I didn’t add many extra veg to my cheesy bean bake – just some onion and tomatoes in the sauce. You could add more though, if you like – just pre-cook them and mix them right in before baking. Peppers, mushrooms, courgette (zucchini), that kind of thing. I made sure this recipe makes a nice big batch – it’ll feed 6 people (or 4 or 5 if you’re extra hungry…). It’s the perfect crowd pleaser – great to feed the whole family, or a big group of friends. 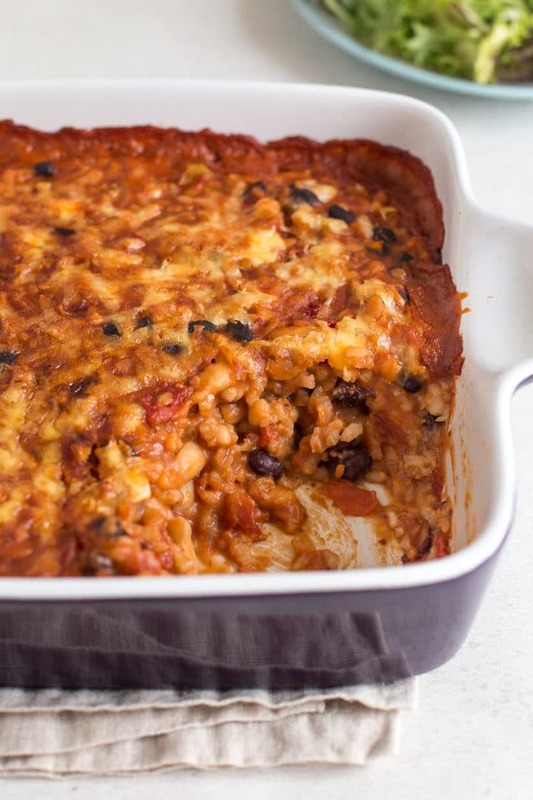 Who wouldn’t love a rich, tomatoey, cheesy bean bake? I know I’ll definitely be making this one again very soon. Heat a dash of oil in a large wok, and add the onion and garlic. Cook over a medium heat for a few minutes, until soft and translucent. Add the arborio rice, and cook for another minute or two. Next, add the vegetable stock a little at a time, stirring regularly and allowing most of the excess liquid to be absorbed by the rice before adding more - it should take around 20 minutes in total. The rice should be almost cooked. 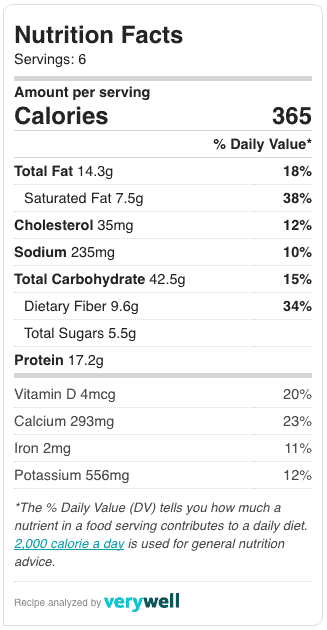 When you've added all of the stock, add the drained beans, chopped tomatoes, and tomato puree. Mix well, and allow to simmer for another 10-15 minutes, until not too much excess liquid remains. Add about 3/4 of the grated cheese, and plenty of black pepper, and mix again to melt the cheese. Transfer the mixture to a large baking dish, and top with the remaining grated cheese. Bake at 190°C (Gas Mark 5 / 375°F) for around 30-40 minutes, until cooked to your liking. For a slightly firmer bean bake, allow to stand for 10 minutes before serving. 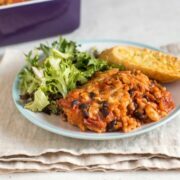 Don’t forget to also try the recipe that inspired this one – one of my most popular recipes, my very veggie lentil bake! This was delicious I did add extra vegetables to it. Thanks Vicky, glad you liked it! I have just made half this recipe as I am only cooking for myself. I used wholegrain rice instead as I have plenty of that around and used mozzarella to increase my protein and reduce the calories from fat. Do you think this would work with whole grain risotto rice? I too have an Instant pot and would want to use that to put this together. I would not want to use tinned beans so, are you able to say the weight of the uncooked beans? Hi Diane, I’m afraid I haven’t tried this with dried beans. I would use the cup measurements (maybe a little less), as I don’t think beans expand too much as they cook? I think whole grain rice would be fine! just made this for dinner. So, Good! Looking forward to having it again tomorrow. Though, I have to say those six servings are not small. ? Damn, I have everything but the two tins of chopped tomatoes. Not sure I want to out to for two tins of chopped tomatoes but I also really want to make this tonight. That does look gorgeous! Definitely one to try, although I’ll probably reduce the quantities a bit (I use dried beans when possible, as I prefer the taste and texture, and now I have an Instant Pot they are so, so easy….). You could probably halve the recipe without too much trouble so it serves 3 instead of 6 :) Though personally I’d recommend making the full batch and freezing the rest – I haven’t tried freezing it myself but I bet it would work well! This is probably a really silly question but do you have any suggestions for replacing the tinned tomatoes in this? I’ve been vegetarian my whole life and even after 32 years I can’t stand the taste of cooked tomatoes (sun dried are the worst and I have a really low tolerance for spice as well… how have I survived?!?!). I have used roasted red peppers in the past but don’t see that it would work in this due to the quantity (also it’s stupidly expensive). Any thoughts would be appreciated because this looks like the kind of thing I would quite happily shove my face in! Hmm I’m not sure! Are all tomatoey sauces out? (how do you eat pizza?!) ;) Blended roasted red peppers could work (you can roast them yourself, much cheaper!). Or you could take it in a completely different direction and keep it creamy and cheesy, maybe add a dollop of ricotta or something?! It’s basically just a bean risotto without the tomato, which doesn’t sound entirely terrible… It would need lots of garlic or something though to make sure it has plenty of flavour. Risotto is my favourite food… probably why this sounds so appealing! Might take some tweaking to get the liquid content right if I use peppers or ricotta (or both!?) instead of the tomatoes but I’m going to give it a try! Pizza without tomato is better than you might think! It gives me more motivation to make it myself (homemade pizza is THE BEST) and use either caramelised red onions or houmous instead of tomato sauce and usually places are pretty good at making it without sauce (although I do often get weird looks). Ooh hummus pizza sounds good! That looks so good! I love the lentil bake, but my kids don’t like it quite so much. I bet they’ll like this one though!